In My Kitchen during January, birthday candles were lit in my honour, the number so large that we had to check the fire ban ratings on the day. 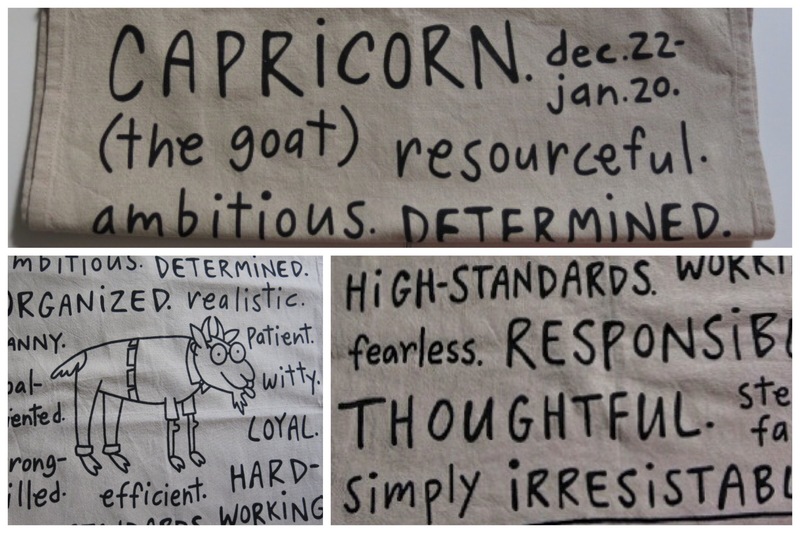 I received a Capricorn tea towel for my birthday. I may be an old goat, but according to this indisputable source, I’m resourceful, organised, efficient, hard working, witty and simply irresistable. The tea towel has spoken!!! My passion for cookbooks is no secret. 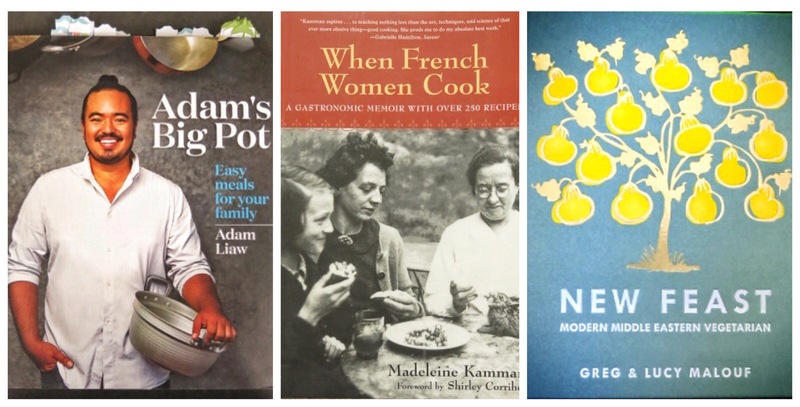 I’d been looking for “When French Women Cook” by Madeleine Kamman for several months, my interest piqued by Debi at My Kitchen Witch. I think my darling husband waded through hell and high water to track down the last new copy in Melbourne. It is a wonderful read! Unprompted, he also surprised me with Greg and Lucy Malouf’s latest publication “New Feast” which is packed full of recipes for light vegetarian dishes with a middle eastern and Indian influence. Greg writes in the intro that he’s moving away from cooking “cheffy” food, pursuing simpler and healthier options, food that’s right up my alley. I made the carrot and chick pea tajine within 2 hours of receiving the book. It was a delicious dish. Standby for a post. Adam Liaw’s “One Pot Meals” is now gracing my kitchen bookshelf too. I’ve bookmarked the recipes I am tempted to try, about 75% of the book. Drawing on his Chinese Malay heritage, the input of his Japanese wife and food memories from travels around SE Asia, the recipes are fresh and light, simple food for family meals. We have a strong artistic gene in our family. My gorgeous number one daughter has inherited the talent. I’m drawn (no pun intended) to lines that sweep and curve, an element that Leah uses to great affect in her drawings and paintings. This was my birthday present from Leah, you might like to visit her Etsy shop. You’re pretty safe in our family gifting food, booze and books. The booze element for my birthday was gin, good gin, made by small batch distillers. 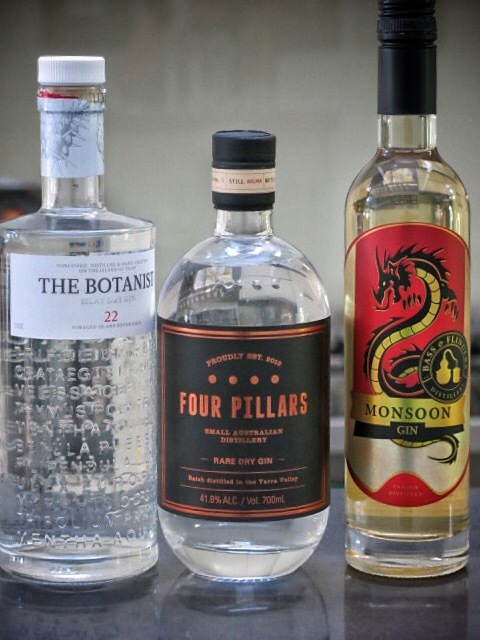 “Four Pillars” gin is a local Melbourne drop with orange overtones made by a Yarra Valley wine maker, while from the Isle of Islay in Scotland I have a bottle of “The Botanist” distilled with foraged local flowers and herbs. I detect juniper, subtle citrus and menthol characteristics. It is so smooth it’s tempting to enjoy it neat, on the rocks. I also have a bottle of locally distilled Bass and Flinders’ “Monsoon Gin,” a far cry from traditional London gin with dominant juniper on the palate, this screams Asia, with lemongrass, ginger and lime. My next challenge is to tailor make tonic water syrups keyed to each gin’s dominant botanical notes so I can drink killer bespoke G and Ts. While the grandkids were visiting we made a pilgrimage to the superlative Gelato Messina in Smith St. Collingwood. Collectively we swooned over the hazelnut, choc mint, lemon, passionfruit and salted coconut with mango. Armed with the recipe book and a love of gelato I began hunting and gathering the required ingredients to go into gelato production. 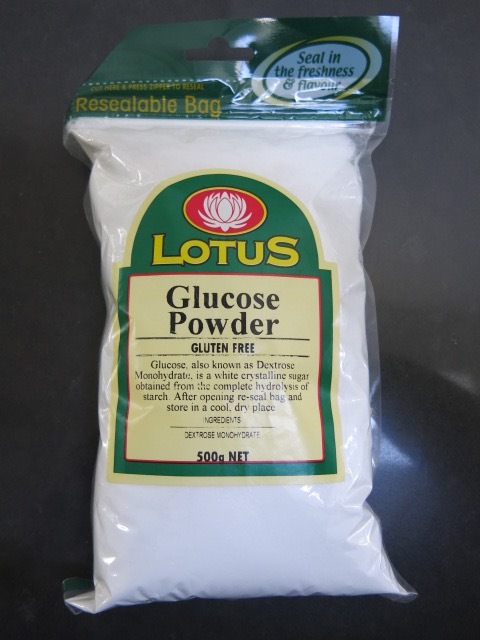 I found the dextrose easily, but when did skimmed milk powder vanish off the supermarket shelves? I had to order it online. Sadly waiting for delivery has delayed my first attempt. Before Christmas I considered buying this gorgeous beaten copper jug, a gift for moi. I ummed and ahhed, then decided I couldn’t justify the asking price. Last week I walked past the same shop and there it was on a sale table, the price reduced by 70%!! Without hesitation I made it mine. Tap water never tasted so good, nor looked so glam. 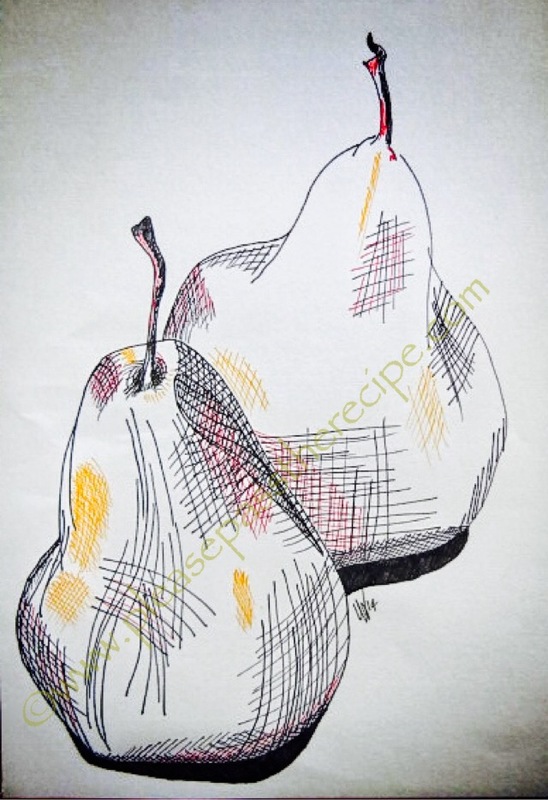 The In My Kitchen series is hosted by the ever generous and lovely Celia at Fig Jam and Lime Cordial. I’m linking up with the world wide food blogging community who post an update each month about their kitchen activity. I pretty much want everything that’s in your kitchen. The tea towel for your birthday is great! I hope you had a lovely day! The drawing is stunning! What talent! I always buy milk powder from Aldi, I don’t know if you have one close by. Thanks for tip about milk powder in Aldi, I’ll check it out…. Happy belated birthday. I absolutely love your tea towel. My husband is a Capricorn and whenever anybody asks, he always says he is a hippopotamus. Hee hee. Your goat has a great sense of humour, just like my tea towel says! Happy birthday! Love the opening photo and there is a lovely feel about this whole post generally. I think Adam is a lovely soul and enjoy watching what he does. Hats off to all who can laugh at themselves, seems like you have a handle in this with the ‘old goat’ comment. Cheers. Thanks Fergie, I never miss the opportunity to have a laugh…. Sandra, I am in love with your jug – absolutely fabulous. What a wonderful tea towel! I’ve long loved Madeleine Kamman’s books, and just came upon a new (not new, of course, but new to me) one. She was definitely prickly, but in a good way. Thanks Michelle, don’t you think all tea towels should say nice things about the cook? Yes, for sure—and clearly that one did! Thanks Margot, don’t the years fly by? I’m going to try tailor to make tonic syrup to match the profile of each gin. Wish me luck! Happy Birthday Sandra- I am now left to imagine how many candles and the date in January. My birthday was also held recently in January- I am Aquarian of the early variety, and they only stuck 5 candles on mine- much to the confusion of the youngest grandchild. The five part means that I am officially retired ( although have been for ages) and am also officially a geriatric ( according to hospitals). Given these awful facts, I think your tea towel is very appropriate. The book by Madeleine Kamman is a a treasure – a great read. Your other books look good too- it’s nice when you bookmark a whole heap of pages- a good sign. Glad you purchased that copper jug. Do they have any more and where? said with envy and jug lust. Happy birthday to you too Francesca! I was 61 on Jan 13th! It’s a great stage of life don’t you think, still fit, and curious but wise enough to rest when needed and wear sensible shoes! I was a little older as you can gather on the 23rd. I am fond of my sensible shoes, and the odd Nanna nap, and travelling with a vengeance. I may have to ‘come out’ of hiding soon with a pic! Happy belated birthday! Looks like you got some lovely gifts. Your daughter is quite talented, I’ll be checking,out her Etsy shop in a minute. Your copper jug is gorgeous, how lucky it was on the sale table! Oh I was so happy to see that copper jug on the sale table there was no hesitation opening my wallet! Happy Happy Birthday Lovely Mrs Recipe! What a fabulous collection of gifties. The tea towel was super cute. I have been eying off Adam Liaws book and with a birthday looming for me and your recommendation, I shall add it to the list! How very talented your daughter is and I am jelly (as the kids say) of all that lovely gin. The copper jug is the bees knees. Tres swish. Thanks Cheery, gin makes you grin! 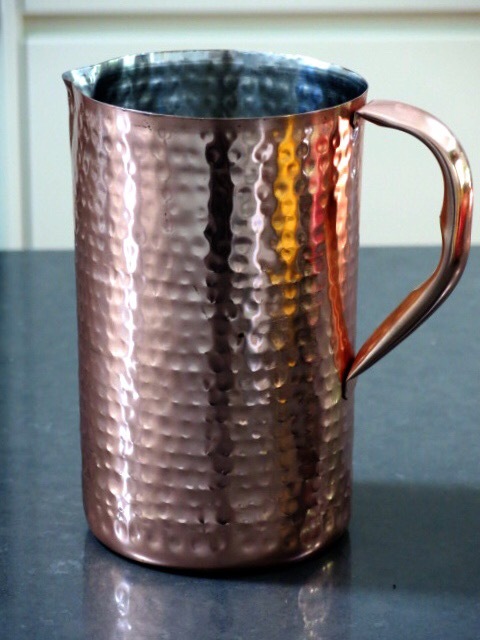 What a gorgeous copper jug – just think of how many Moscow Mules you’d fit in there 🙂 I think you and I both have The Asian After Work book don’t we? I use it a lot so I’m looking forward to getting my hands on Adam’s new book. Happy belated birthday! Thanks Nancy, yes I have both Liaw’s books now. I make the steamed pork belly wombok dish frequently thanks to your recommendation, we just love it! I’ve never tried a Moscow mule so a whole jug full seems a bit daunting. I’ll have to get the SIL/barman to get mixing! So glad you got a copy of When French Women Cook – what a wonderful husband you have to track down a copy. I really love the writing and I’m sure you will as well. The recipes are good, too, but I think the procedures are a bit too complicated (or perhaps old-fashioned) at times. I just use it as a guide and inspiration. So, Happy Birthday dear Capricorn! Love all your gorgeous presents. And, that beaten copper jug is fab. The shape is just like the graduated copper jugs found in Greece called kartoutsia – mainly used for serving wine that comes from the barrel. I’ve finished reading Kamman’s memoir and absolutely loved it, especially the chapter about her Grandmother. I’ve marked a few recipes to explore further. Any more gems like this you can recommend? May have another one up my sleeve, but need to finish it first before reporting back more fully in a post. If you want to have a go before I post on it. It is called Pomp and Sustenance: Twenty-Five Centuries of Sicilian Food by Mary Taylor Simeti. It has been reissued in paperback and kindle under the more prosaic title Sicilian Food: Recipes from Italy’s Abundant Isle. It is well written, filled with history and stories, but not quite as personal as Kamman’s book. Recipes look good, however. But, then, I really love Sicilian food! Just downloaded the kindle edition, look forward to some bedtime reading, thanks…. This entry was posted on February 3, 2015 by ladyredspecs in Food and tagged in my kitchen.